The passenger boat operator I Battelli del Brenta® (The boats of the Brenta Canal) provide enjoyable guided public cruises, from Venice to Padua or viceversa, along the Brenta Canal (Riviera del Brenta), visiting some of the Venetian Villas, summer residences of the 18th century, with stops at the monumental palaces with its legendary frescoes. Once along this waterway sailed the “burchielli”, boats that carried the Venetian nobleman. As in the past, even today the Burchiello®, become a regular scheduled touristic service, cruises along the Brenta Riviera from Padua to Venice and viceversa. Today the Burchiello is a modern and comfortable boat, equipped with a cabin and comfortable sofas, air-conditioning, a bar and toilets, and a panoramic deck that offers passengers a full view around. And also other boats sailing along the Riviera del Brenta. Some of the boats are modern, some others are traditional and romantic "burchi" (old wooden barges) even mentioned by Dante Alighieri in the Divine Comedy. 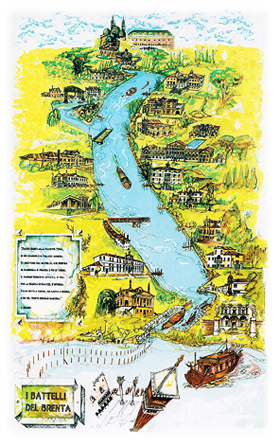 The company "I Battelli del Brenta" has many boat carrying from 50 to 120 passengers. The guided cruises usually include boat trips from Venice to Padua (Venezia, Fusina, Malcontenta, Oriago, Mira, Dolo, Stra, Padua) or from Padua to Venice (Padua, Stra, Dolo, Mira, Oriago, Malcontenta, Fusina, Venezia); the visits to the Villa Gradenigo of Oriago, to the Villa Widmann or Barchessa Valmarana of Mira, to the Villa Pisani of Stra, to the Villa Foscari Malcontenta; the guide and the lunch optional on restaurant; other programs include the Venetian Lagoon. Some programs include departure or arrival in the historical centre of Padua at the old fluvial port "Portello" with its Steps of the 16th century. A daily cruise from 09.00 to 18.00 proposes navigation, stops and the visit to three Venetian Villas and the guide; the lunch, in a restaurant on the is optional on restaurant. Special short cruises and half day public and private group programs are available. We are also a receptive operator; rates for transfers by boat or coach, excursions and visits to the sights and the parks, hotel accommodation and more on request.